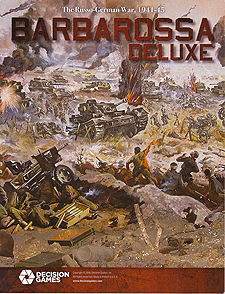 Barbarossa Deluxe, designed by Ty Bomba, is a strategic-level, two-player "mini-monster" of intermediate complexity that covers the entire Russo-German War. The German player begins the "Grand Campaign Scenario" on the offensive, attempting to win by seizing key areas on the map. The Soviet player is at first primarily on the defensive, but the situation requires he halt his opponent's push to the east and then, in turn, launch a series of counter-offensives that will eventually take the Red Army to Berlin. Play may end sooner than the historic termination time, if the German player is able to do significantly better than historic counterparts by advancing so quickly he causes the overall political, social, economic and military collapse of the Soviet Union. Likewise, if the Soviet player is able to carry out his strategic comeback more efficiently than did his historic counterparts during the second half of the real war, the game may again end earlier that it did historically. Each extra-large hexagon on the two-sheet map represents 55 miles (90 kilometers) from side to opposite side. The large-size (5/8") counters provide corps as primary units of manoeuvre for the Germans, while for the Soviets they're armies. The full order of battle is easily the most complete ever published in any simulation at this level, including every corps, corps equivalent, army, army detachment, fortress command, Tiger battalion, cavalry-mechanized group, and ad hoc large-size unit that took part. The effects of the general air superiority enjoyed by the Germans throughout much of the campaign, and then by the Soviets in its late stages, are built into the movement and combat rules. At the same time, there are also "air Armies" and "air fleet" counters in the order of battle, as well as the entire Soviet arsenal of "Breakthrough Artillery" corps. Each full game turn represents one to two months, depending on the time of year. There are six scenarios included: The Grand Campaign, 1941-45; The Road Back, 1942-45; Operation Blue & Kremlin, 1942; Operation Citadel, 1943; What If: Manstein's Gambit, 1943; and What If: 1942 (assuming the war didn't start until a year after its historic date). Both the multi-year scenarios can be played out in a long day of gaming, while the one-year scenarios can each be completed in under four hours. All the historic scenarios come with full historic set ups.